From memorial services to dedications, residents and elected officials marked the one-year anniversary Monday of deadly tornadoes that tore through central and southern Illinois, leaving more than half a dozen people dead and destroying numerous homes and businesses. Among the hardest hit was the central Illinois community of Washington, where more than 1,000 buildings were destroyed and three people died. Mayor Gary Manier said the recovery process has brought people together. 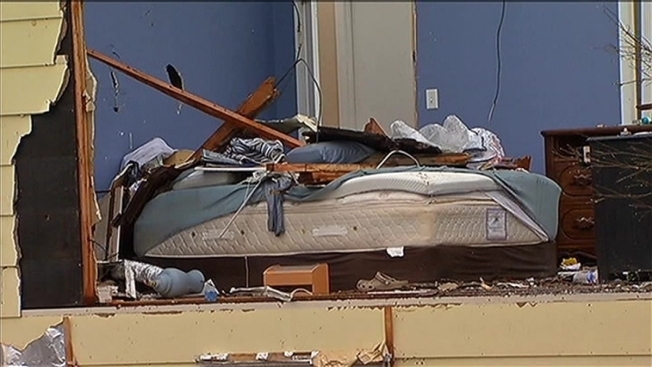 Officials say most of the buildings that were damaged or destroyed one year ago when a deadly tornado tore through the central Illinois community of Washington will be rebuilt by the end of 2014. Not only do officials estimate that 75 percent of the 1,108 buildings will be rebuilt by the end of the year but that the number might climb as high as 90 percent by the end of 2015, The Peoria Journal Star reported. City Administrator Tim Gleason said the numbers are "amazing" because officials expected only about half the buildings would be rebuilt by the end of this year. More than a half dozen people died as a result of the tornadoes that stuck Washington and other area communities on November 17, 2013. But the town is on the mend and a spirit of celebration is starting to emerge. Washington Mayor: "We're Really Doing Well"
Gary W. Manier, the mayor of Washington, Illinois, says the recovery of his community after deadly tornadoes has been remarkable. A first aerial look at the damage caused by Sunday's devastating tornado in Washington, Ill.
"As we get through life, we get so busy. Sometimes we don't know all our neighbors. Now, everybody's holding block parties. They're all friends because they helped each other out of basements. They helped clean debris off of other properties with each other," Manier said. "It just made us even closer." While the local governments in Illinois were denied federal disaster funding, the state provided millions to help through the rebuilding and recovery process. Washington received $13.4 million and Brookport got $2.9 million, according to Gov. Pat Quinn's office. The Chicago Democrat's Monday itinerary included stops in Washington and Brookport. In a statement, Quinn said it was time to "reflect on the healing process." "Tragedy struck Illinois last November, but we refused to give up on these towns no matter how long it took for them to get back on their feet," Quinn said. In the small central Illinois farming community of Gifford, attendees of St. Paul's Lutheran Church reflected on the past year during Sunday services. "Just a year ago, a tornado paid a brief but brutal visit to our community," St. Paul's pastor, the Rev. Steven Lombardo, told congregants, according to the (Champaign) News-Gazette. "In the space of seconds, life changed."